Lionel Messi made a young Argentina fan's year after the child had been prevented from meeting his hero. Messi had just touched down in Montevideo ahead of Argentina's World Cup qualifier with Uruguay. 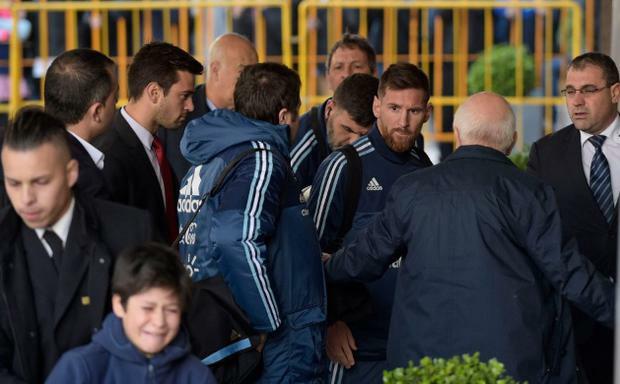 As the Barcelona striker and his Argentina teammates were ushered into their team hotel, an opportunistic young fan tried to squeeze past security to meet the 30-year-old. The boy was dragged away by staff before getting the chance to meet his idol. However Messi, seeing the boy being led away in tears, demanded that the child be brought back before hugging the lucky fan as well as posing for a series of photos. The match ended a goalless draw leaving Jorge Sampaoli's side 13 points adrift of Brazil, who sit top of the South American World Cup qualifying group. Before the match Messi and his Barcelona teammate Luis Suarez stood side-by-side to promote Argentina and Uruguay's joint-bid to host the 2030 World Cup. The top four teams automatically qualify for the World Cup, while the fifth-place team plays in a two-match playoff to secure a place.